What an incredible year 2011 has been for me and my professional development! While I was nothing more than an ordinary yet enthusiastic lurker in 2010, I dared and I did in 2011! Despite being a shy presenter I plucked up the courage to present at two ELT conferences and a Teach Meet and I gave a talk on new technologies in education to teachers in two schools in Zagreb. I'm extremely proud of the series of webinars for students that Sonja and I launched in the spring. There were 13 webinars that I co-hosted and/or presented at and they proved to be extremely successful, useful and popular among the student population. Besides student webinars, I delievered two webinars for teachers, entitled School Without Walls and Safer Internet Day - How They Do It. 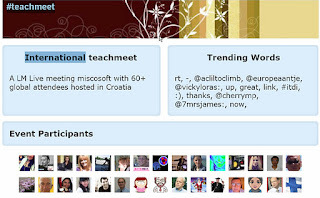 I was a co-presenter at the webinar about the Microsoft Partners in Learning Institue 2011. If anything deserves to be described as a truly out of this world experience, then the two yesterday's webinars should be it! 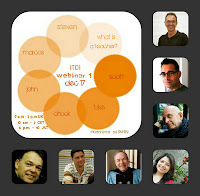 The iTDi webinar and the TeachMeet Int'l definitely set new standards for professional development and I'd like to express my heartfelt thanks to all the speakers and participants who shared their experiences, ideas and best practices and sent out a great deal of good vibrations into the cyberspace. I'm especially grateful to Bart and Sonja, my co-hosts for the TeachMeet Int'l for their wholehearted support before, during and after the event. The Twitter back channeling was absolutely amazing and I extend my huge thanks to Jeannette @7MrsJames for compiling the tweetdoc and for being there with us although it was middle of the night in Australia. Jeannette has written a wonderful post about this special day, and so did Vicky, who was one of the TeachMeet Int'l esteemed presenters. At 10:00 am CET, iTDi will be hosting a special webinar What's a Teacher? moderated by Shelly Terrellwith live online presentations by Scott Thornbury, Luke Meddings, Marcos Benevides, Steven Herder, Chuck Sandy, and John Fanselow. 300 teachers from 57 countries have registered for the event. Are you one of them too? 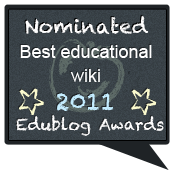 I feel elated and excited because my wiki Greetings From The World has been nominated for the Edublog Awards 2011! This is the third time in a row that it has been nominated and if you take a look at the sidebar you'll see that GFTW is the proud winner of the 2009 and 2010 Eddies.